This trip begins from Cape Town and covers many beautiful towns before it ends in Cape Town again, after 17 nights. The complete package is priced at just over £1063* per person sharing. Single supplement is also available at approximately £442*. The package is valid from 1st January 2018 to 31st October 2019. The above table is the Itinerary for the Wine, Nature & Safari Package from Cape Town. Camps Bay is a trendy suburb of Cape Town, nestling below the magnificent Twelve Apostles Mountains. It has one of the most beautiful white sand beaches in the world. The beach is a blue flag beach and has been rated as a Top 10 Beach by the UK Sunday Times as well as Top Beach in South Africa by readers of the local Sunday Times. 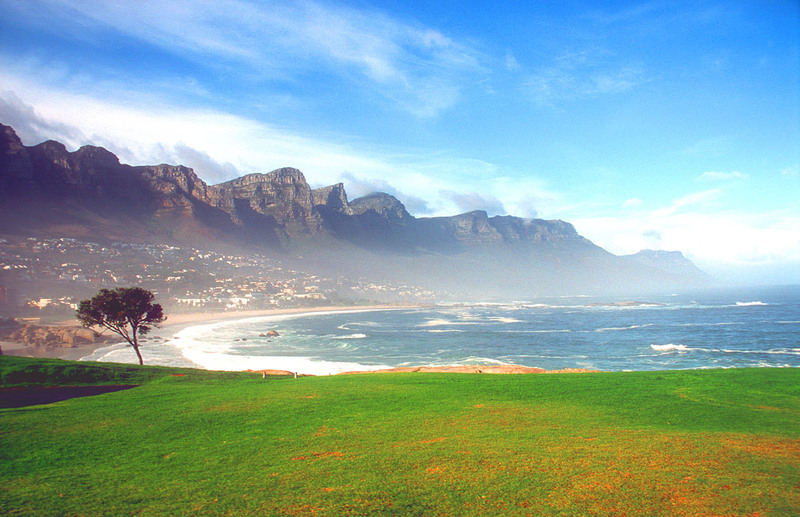 Camps Bay offers a wide range of activities including shopping, hiking, surfing and swimming. The charming historical town of Tulbagh is situated in the Witzenberg Municipal area, near Wolseley, Prince Alfred’s Hamlet, Gouda and Ceres, in the Winelands of the Boland in the Western Cape Province, South Africa. The town is situated on the northern end of the beautiful and fertile Tulbagh valley. The valley is almost completely surrounded by majestic mountain ranges – the Obiqua mountains to the west, the towering Winterhoek on the northern end and the Witzenberg on the eastern side of the valley. The Great Winterhoek mountains tower 2077 metres above sea level and are picturesquely snow capped in winter. A diverse flora is abundant all over the valley and in the mountains. Robertson sometimes referred to as the ‘muscadel and brandy capital’ of the country was founded in 1853 and named after Dutch Reformed minister Reverend Dr W. Robertson. With the rich alluvial soil and plenty of water from the Breё River the new town flourished and was well known for its wagon making and cabinet and clock makers. Nowadays the town is known for its wines, brandy, sherry, liqueurs, world renowned racehorse breeding farms and fruit farms. There are many other attractions to explore around Robertson, from a river cruise, to a mountain hike, to outdoor picnics and to exploring the rich historical sites. Oudtshoorn is the tourist capital of the Little Karoo. The town is famous for its ostrich farms, where one can view the ostriches; ride on the back of one, purchase their feathers, shells, leatherwear made from their hides and even savour their unique steaks at one of the restaurants in the town. Ostriches are the world’s biggest birds and can grow to a height of two metres and a weight of about 150kg. The famous Cango Caves with their giant stalagmites and stalactites are situated +-30km to the north of the town and are well worth a visit. The park is a large reserve (120 000 ha or 296 500 acre) situated in the Sundays River Valley. The original elephant section of the park was proclaimed in 1931, when only eleven elephants remained in the area. Today this finely tuned ecosystem is sanctuary to many more elephants, a vast number of Cape buffalo, black rhino, a variety of antelope species, as well as the flightless dung beetle – found almost exclusively in Addo. They’re regularly encountered in the park, especially after rain, rolling their ball of dung to some suitable spot where it will be buried, a way to recycle nutrients. St. Francis Bay boasts a temperate climate of warm summers and mild winters, a magnificent beach providing safe bathing, nature reserves, a deep water harbour and fantastic surfing. The Kromme River, navigable for 10 km, twists and winds its way down to a marina. The Bay – a gently sloping beach provides safe bathing as well as some of the finest rock and surf angling on the East Coast. The bay itself is world famous for its waves and is frequented by surfers from all over South Africa and overseas. choice of cosy bars or restaurants to choose from to while away your evenings. The winter days in this area are also very pleasant. Swellendam was built in 1746 and is the third oldest town in South Africa after Cape Town and Stellenbosch. It lies in the shadow of the Langeberg Mountains and is generally regarded as the capital of South Africa’s merino sheep-farming industry. The bontebok one of the rarest species of antelope on earth can be found here, along with many other species of game. Stellenbosch was originally a border post established in 1679 by Governor Simon Van der Stel. The town lies in the West Cape in a lovely and fertile valley, which produces much of the wines for which South Africa is famous. Stellenbosch is one of the oldest and best-preserved towns in South Africa. The town has many historical buildings of Dutch, Georgian and Victorian origin. Beautiful old oak trees shade these buildings. Stellenbosch is also a university town, which makes it a lively student centre. GOLD hosts an interactive drum circle every evening with master facilitator, Eddie. You are given your own djembe drum, and Eddie teaches you the different sounds and rhythms of the djembe. A set 14 course menu consisting of Cape Malay cuisine and African cuisine will be served to you by one of the staff who will explain each dish to you and from which country the dish originates. Be captivated during dinner by the tall, graceful Mali Puppets as they dance around your table with the drummers and singers. On this day tour, you will see Oudtshoorn’s ‘Big 7’ in one day! You visit an ostrich show farm where you will learn more about the largest bird on our planet. The well-known Cango Caves for the standard tour. (1 hour tour ~ temperature about 19°C). Drive over the historic Swartberg Pass. Lunch. Visit Prince Albert. Drive through a part of the Great Karoo, with long distance views and desolate places. Drive through the Swartberg Canyon. Visit the Meiringspoort Waterfall. We drive further, passing the little town of De Rust and the stunning Rooiberge… dropping you back at your accommodation after a wonderful day exploring this beautiful region. Depart from Cape St Francis Resort and head down to the penguin rehabilitation centre. From there you travel to Talhado Childrens Home . Then onto Nomvulos Knitters – a feel good story, previously unemployed persons who now knit the most beautiful garments. A light lunch at Port St Francis is for guests own account. Enjoy tastings at 2 superb wineries and 1 distillery, you will cycle along private farm roads and enjoy the view of mountains and sea. Guides will inform you on how South Africa’s oldest wine route developed along the famed Eerste River whilst you dip your feet in it and revel in the natural splendor of your surroundings.